"In the Spirit of Service for North Carolina!" The Ladies Auxiliary of the Sons of the American Revolution was founded in California in 1984. In 2003 The National Ladies Auxiliary of the Sons of the American Revolution became a subordinate of the NSSAR. Today there are state organizations in California, Alabama, Arizona, Florida, Georgia, Illinois, Indiana, Kansas, Massachusetts, North Carolina, Ohio, Texas and a group of members at large who live in States without a Ladies Auxiliary. The Ladies Auxiliary of North Carolina was organized in 2009. We encourage our members to do whatever they can to help with their local SAR Chapter activities. The auxiliary members can help with the youth programs, service projects, grave markings, chapter banquets, fund-raisers, school programs, etc. 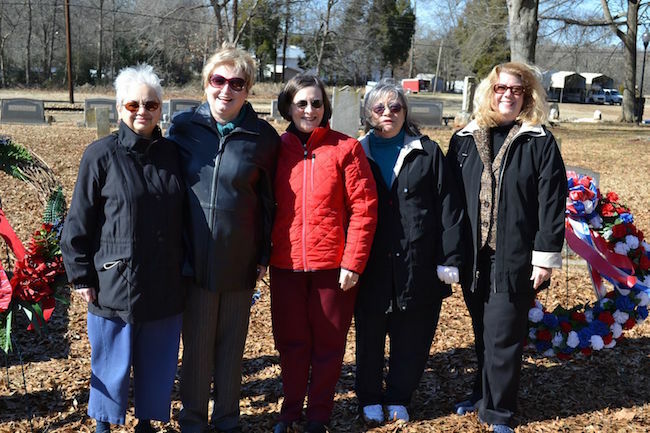 The North Carolina Ladies Auxiliary also supports the National Ladies Auxiliary through providing baskets and donations for their fund-raisers and by participating in their projects. We meet three times a year, at the Board of Managers meetings and at the Annual State Convention. Interested in joining? A woman who is related by marriage or bloodline to men in the SAR, who are members in good standing and those who are related to deceased SAR members are eligible for membership in the State and National Ladies Auxiliaries. We welcome any wives, daughters, mothers, sisters, etc. to become active members of the North Carolina Ladies Auxiliary. Our dues are $10 a year. Come to a Board meeting with your SAR member! The Ladies will be there and welcome you!